Days 4 and 5 of our trip to Germany had very full itineraries, were very intense, and very emotional. We felt quite wrung out at the end of each day. 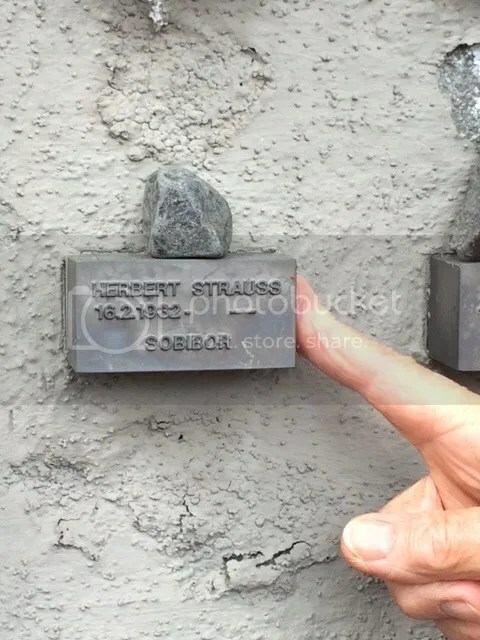 On Wednesday we travelled to Frankfurt, visiting the Jewish Museum, the site of the Hirsch Realschule where my father in law and his siblings studied, and passed by the place where my grandfather and my father-in-law once lived. In both places, neither the houses nor the streets themselves exist any more. We concluded with a visit to the Old and New Jewish cemeteries. 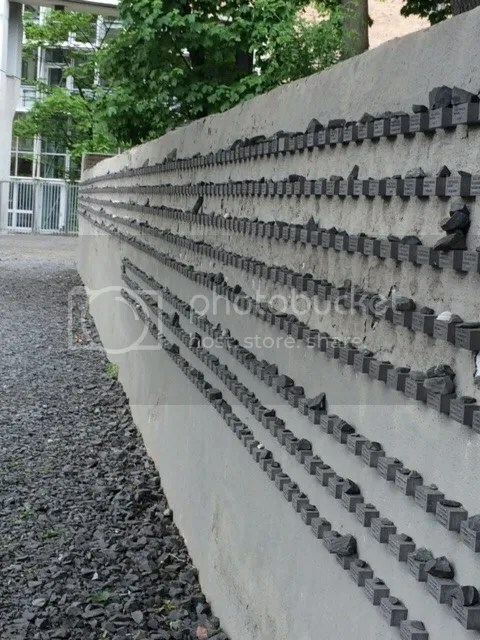 The walls of the Old Cemetery are embedded with tiny stones with the name, birth date, and date and place of death if known, of every single Jew from Frankfurt who was killed in the war. It was the first time that I shed any tears in Germany and am still processing all that I saw and felt. They say that 6 million is a statistic but one person is a tragedy. 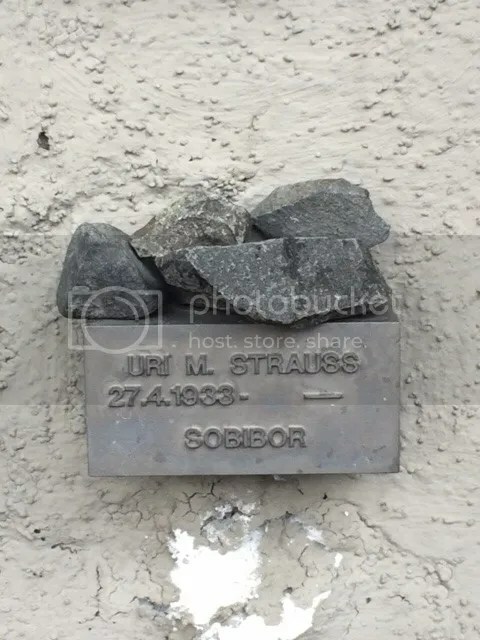 Seeing those stones, and finding the names of my mother’s three brothers, was a personal emotional jolt, yet seeing the hundreds of yards of stones along the walls of the cemetery emphasised the sheer numbers, the statistics, the magnitude of the Holocaust. Yesterday, Thursday, we travelled to Fuerth, our father’s home town where we had a fascinating tour of the Jewish Museum and viewed the ancient Mikve (ritual bath) which still existed and was filled with water rising from an underground well, which was situated underneath the museum, which had itself once been a private house. We saw the house where my father lived, the school where my paternal grandfather taught, which I was pleased to note still served as a Jewish community center, and the house where my father’s grandparents lived. We also saw the town square where my father’s family was marched to on Kristallnacht, and then the library, which is now a theater, where my grandfather and the other men were taken to after the initial “assembly”, to be beaten by the Nazis. Again, it was shocking to actually see the places, and to absorb how innocuous these sites seem to be today. We continued to the Old and New cemeteries to find graves of long deceased relatives, and then finished with a visit to the Schulhof, the square where 4 synagogues once stood together. 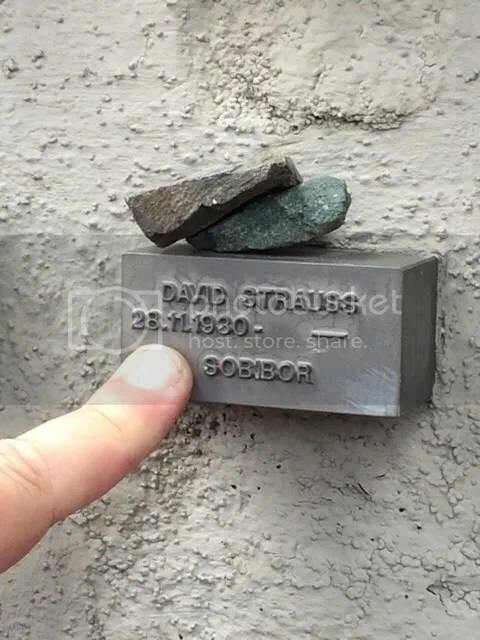 They were all burnt down on Kristallnacht, and all that is left now is a monument, and a modern housing estate around the square. My father recalls asking his mother “why is the sky red?” as they returned from their forced march to the square on Kristallnacht, and his mother saying “Quiet! Don’t say a word!”. I’m trying to imagine his trauma as a 9 year old child, and cannot fathom it. We continued our journey to the little village of Schopfloch, an altogether happier affair, where we saw the place where our paternal grandmother grew up. We had imagined a little dumpty town but it is in fact quite a pretty little village. I apologize for the lack of more photos for the moment. We are now sitting at the gate in Frankfurt Airport, waiting to board our plane home to Israel. Since we are due to land at around 4 p.m. and don’t expect to be home much before 6 p.m., and Shabbat begins around 7, this post is going to be cut short here. I will update with further posts including more pictures, and maybe even guest posts from my brother and Otto Haag, in the coming days. Wishing ourselves a safe journey home and wishing you all a Shabbat Shalom!